Responsible whale watching is whale watching that adheres to the core whale watching principles identified by the International Whaling Commission's body of experts in 1996. In brief, responsible whale watching manages the potential impacts to the animals that are being watched, and allows the animals to determine the nature and duration of interactions as much as possible. Why is this important? Whale watching is usually perceived as an ‘eco-friendly’ venture – an activity that gives value to whales as one of nature’s spectacles for humans to enjoy, and that can contribute to local communities and economies. However, many studies have shown that whale watching activities, when not conducted responsibly, have the potential to significantly disturb, and ultimately decrease the chances of long-term survival of the animals that are being watched 1-3. Many whale and dolphin populations are facing serious threats – and whale watching should not add to these: Most baleen (and some toothed) whale populations suffered severe declines after centuries of whaling. While many baleen whale populations are recovering since the world-wide moratorium on commercial whaling came into effect in 1986, some do not appear to be increasing4,5, and all whale and dolphin populations face a number of new modern-day threats, among them accidental entanglement in fishing gear (known as bycatch)6,7, climate change4,8-11, ship strikes4, 12-14, marine pollution and loss or deterioration of important habitat15-18. Unfortunately, whale watching has the potential to contribute to these pressures. Boat-based whale watching exposes whales and dolphins to underwater noise, as well as the risk of injury from collision with the boat’s hull or propeller19,20. The presence of boats can distract the animals from important behaviours like resting, socializing or feeding1,3,21. Being distracted from these activities can have a negative impact on individual animals, particularly those that are more vulnerable like calves, pregnant females and females still nursing their young. The potential harm increases when more vessels are present, and when boats are present more frequently and for longer periods. Whales and dolphins around the world face multiple threats from ranging from habitat loss to bycatch in fisheries. Whale watching should not compound these threats. Photo of bottlenose dolphins near fishing harbour in Walvis Bay Namibia, courtesy of S. Golaski, Namibian Dolphin Project. Whale-watching has the potential to disturb the whales and dolphins they target: Whales and dolphins are mammals with similar stress response systems to other mammals, including humans. Many whale and dolphin species have exceptionally strong family bonds, with calves of most species being dependent on their mothers for feeding and learning for at least 6 months, if not several years. Bearing these characteristics in mind, the intrusion from whale watching vessels can be likened to having someone enter your home operating some loud machinery while you are trying to eat a meal, sleep, or help your child read or do homework. You might be able to tolerate this for 30 minutes a day, or a few times a week, but imagine this intrusion taking place for several hours every single day without end, or having not one, but five people enter your home, each operating a jack hammer, vacuum cleaner, or electric drill. Not only would you find it difficult to continue eating your meal, sleeping, or talking with your child, but your stress levels would increase, elevating your heart rate and blood pressure, and causing stress hormones to surge through your body. This is likely what many groups of whales or dolphins experience at popular tourist sites where there are no restrictions on the type of boats, the number of boats, or the frequency of tours that are allowed to be conducted. Guidelines and regulations can help to reduce disturbance to whales and dolphins: In many parts of the world, local, regional or national governments have introduced regulations to minimize the disturbance to whales or dolphins by limiting the number of tour operators, vessels, times of day or number of tours that can be conducted in a specific area. These regulations usually also include strict approach guidelines, limiting the vessel speeds and specifying the distances that boats must maintain from groups of whales or dolphins. Returning to our ‘uninvited noisy visitor’ analogy: the intrusion would be slightly more tolerable if you could ensure that the intruders with their loud machinery stayed outside your front door, in the next room - or better yet, down the road. If you or your children became curious, and wanted to see what they were doing, you could walk down the road and have a brief look, and then return to the safety of your home to continue your meal or sleep or homework. This is the principal that should guide most whale and dolphin encounters: allowing the animals to determine, as much as possible, how they choose to interact with the vessel, rather than approaching too closely, pursuing or harassing the animals in other ways. Approach guidelines for whale-watching boats can reduce the potential stress and disturbance to whales and dolphins. 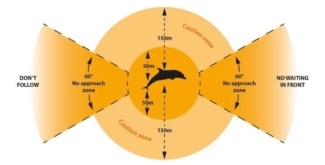 This example of an approach diagram is taken from the Australian National Guidelines for Whale and Dolphin Watching (see link below). Responsible whale-watching with an educational component can create a net conservation gain for whales and dolphins, rather than a long term negative impact: Some regulations, such as those in New Zealand, go further to stipulate that whale watching tours should not only try to limit the potential negative impacts that they have on the target animals, but that they should aim to have a net conservation benefit, by including services “of sufficient educational value”. 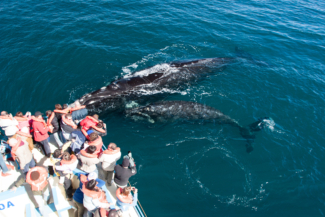 Many hope that participation in whale watching tours with a strong educational component has the potential to raise tourists’ environmental awareness and render them more willing to play a more active role in conservation efforts22. Tourists can contribute to this effort by using the Questions you can ask when booking a tour on this site to ensure they are choosing a tour operator that operates responsibly and not only minimizes its impact on the target animals, but actively contributes to conservation efforts. In some areas, like the Alaskan and North Atlantic coasts of the USA, there are training and accreditation schemes like Whale Sense, that help tourists to recognize and choose responsible whale watching operators. Recreational boaters can educate themselves about regulations that are in place to protect whales and dolphins in their area and/or best practices to minimise their impact on whales and dolphins where no formal regulations are in place. Operators are encouraged to adhere to local, regional or national guidelines where they exist, and consider collaborating with other operators to create self-regulating consortia where no formal guidelines are in place. Operators can use the many other best-practice guidelines that are available on this site, such as the tips on how to offer the best possible experience; whale watching as an opportunity for education; ways to contribute to research and conservation; and ways to support local communities. Managers may consider the drafting, implementation, and enforcement of clear guidelines. A number of case studies on this site provide examples of successful management and regulation of whale watching in different parts of the world. Managers may consider the drafting, implementation, and enforcement of clear guidelines. A number of case studies on this site, as well as the section on management strategies and tools provide examples of successful management and regulation of whale watching in different parts of the world. Thomas, P. O., Reeves, R. R. & Brownell, R. L. Status of the world’s baleen whales. Marine Mammal Science, doi:10.1111/mms.12281 (2015). Wade, P. R., Reeves, R. R. & Mesnick, S. L. Social and Behavioural Factors in Cetacean Responses to Overexploitation: Are Odontocetes Less “Resilient” Than Mysticetes? Journal of Marine Biology (2012). Read, A. J. The looming crisis: interactions between marine mammals and fisheries. Journal of Mammalogy 89, 541-548 (2008). Avila, I. C., Kaschner, K. & Dormann, C. F. Current global risks to marine mammals: Taking stock of the threats. Biological Conservation 221, 44-58, doi:https://doi.org/10.1016/j.bioc... (2018). Burek, K. A., Gulland, F. M. D. & O’Hara, T. M. Effects of climate change on Arctic marine mammal health. Ecological Applications 18, S126-S134 (2008). Dolar, M. L. L. & Sabater, E. R. Potential impact of climate change on marine mammal biodiversity in Southeast Asia: a review. Silliman J 52 (2011). Gambaiani, D. D., Mayol, P., Isaac, S. J. & Simmonds, M. P. Potential impacts of climate change and greenhouse gas emissions on Mediterranean marine ecosystems and cetaceans. Journal of the Marine Biological Association of the United Kingdom 89, 179-201 (2009). Simmonds, M. P. & Eliott, W. J. Climate change and cetaceans: concerns and recent developments. Journal of the Marine Biological Association of the United Kingdom 89, 203-210 (2009). Cates, K. et al. Strategic Plan to Mitigate the Impacts of Ship Strikes on Cetacean Populations: 2017-2020. Report presented to the meeting of the Conservation Committee of the International Whaling Commission IWC/66/CC20, 19 (2016). Laist, D. W., Knowlton, A. R., Mead, J. G., Collet, A. S. & Podesta, M. Collisions between ships and whales. Marine Mammal Science 17, 35-75 (2001). Panigada, S., Leaper, R. & Arcerdillo, A. Ship strikes in the Mediterranean Sea: assessment and identification of conservation and mitigation measures. Journal of Cetacean Research and Management (2010). O’Shea, T. J. in Biology of Marine Mammals (eds John.E. Reynolds & Sentiel. A. Rommel) (Smithsonian Institute, 1999). Tanabe, S. Contamination and toxic effects of persistent endocrine disrupters in marine mammals and birds. Marine Pollution Bulletin 45, 69-77 (2002). Wu, Y. et al. Evaluation of organochlorine contamination in Indo-Pacific humpback dolphins (Sousa chinensis) from the Pearl River Estuary, China. Science of the Total Environment 444, 423-429 (2013). Jefferson, T. A., Hung, S. K. & Wursig, B. Protecting small cetaceans from coastal development: Impact assessment and mitigation experience in Hong Kong. Marine Policy 33, 305-311 (2009). 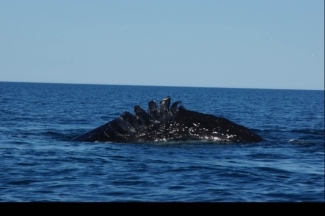 Au, W. W. L. & Green, M. Acoustic interaction of humpback whales and whale-watching boats. Marine Environmental Research 49, 469-481 (2000). Christiansen, F., Rasmussen, M. & Lusseau, D. Whale watching disrupts feeding activities of minke whales on a feeding ground. Marine Ecology Progress Series 478, 239-251 (2013). Orams, M. B., Forestell, P. & Spring, J. in Whale-watching: Sustainable tourism and ecological management (eds James Higham, Lars Bejder, & Rob Williams) Ch. 9, 110-127 (Cambridge University Press, 2014).